At a hosted tasting of the winter menu, Brady Weise and Greg Gertmenian were behind the stick during a busy dineLA Restaurant Week dinner service. Noting the lively crowd that braved the rainy streets, Ruiz said that 1886 is “a destination spot, large groups get together here and the stay the whole night.” Buoyant and energetic as always, Ruiz described the wide range of responsibilities she’s learning in the new job, her first as a bar manager. She’s currently working Friday and Saturday nights, with her shifts beginning at 8pm until she’s done closing at 4am. Of course, learning systems, placing orders, taking calls and other managerial duties bring her to Pasadena during the rest of the week as well. And then there are Tello’s “homework” assignments, which Ruiz described with mock fear. (At least, one hopes that her look of terror was fake.) Ruiz said that the 1886-Raymond team has been incredibly supportive, with Tello in particular always available to answer her questions. Though she hasn’t tended bar since beginning her new gig, Ruiz plans on bartending on one night beginning in a few weeks. 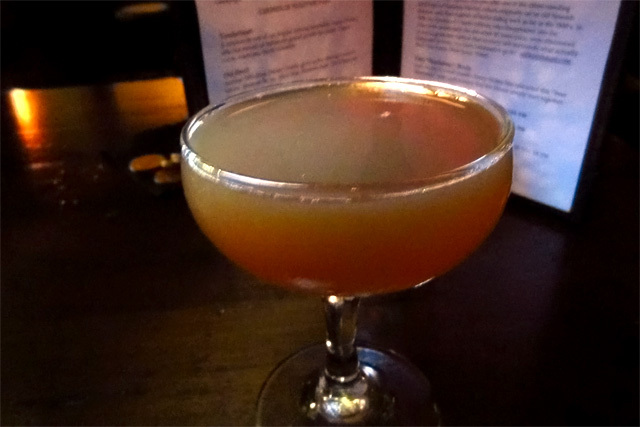 The tasting began with Ruiz’s favorite from the winter menu: the Bank Heist, a Silky cocktail made with Bank Note Scotch, plum syrup and bitters. The Bank Heist was created by 1886 bartender Peter Lloyd-Jones, who was inspired by an incident that took place in Pasadena’s historic Union Savings Bank building, where the gruesome remains of three bank robbers were discovered in 1946. According to local lore, three robbers broke into the bank’s basement vaults in 1901, but couldn’t get away when the building was surrounded. The robbers mysteriously disappeared, while all of the stolen gold pieces were recovered. 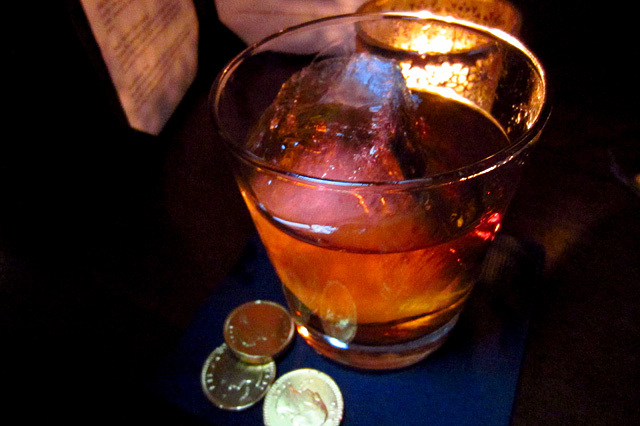 Lloyd-Jones extends his nod to the story with the chocolate “gold coins” that are the cocktail’s inventive garnish. 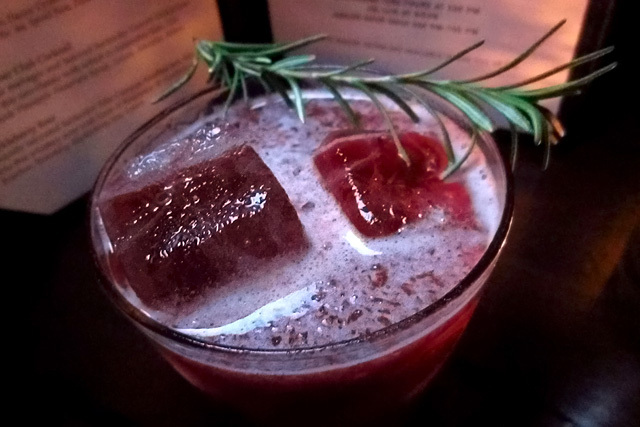 Next was a Ghosts of Yuletide Past cocktail from recently relocated bartender Eder Campos, the Huckleberry Sour: bourbon, rosemary, huckleberry jam and lemon. 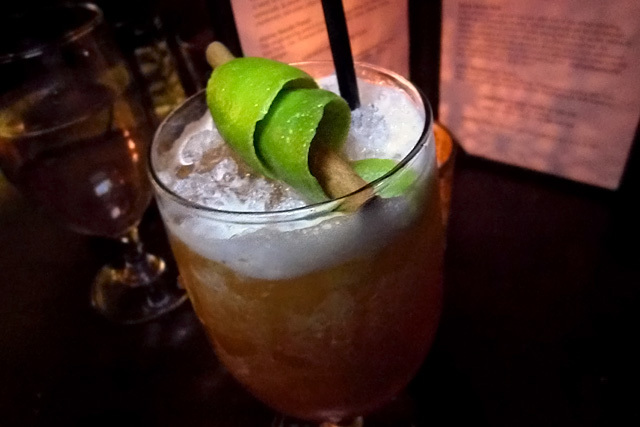 Ruiz said that Campos’ sweet and tart variation on the classic Whiskey Sour is the most popular drink from the winter cocktail menu. The rosemary garnish offered a nice aroma that went especially well with the roasted lamb necks and Afghan bread, one of my go-to bar bites at 1886. 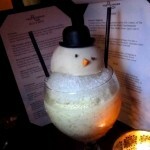 Other legacy cocktails include creations by Laura Lindsay, Danny Cymbal and previous 1886 bar manager Garrett McKechnie. 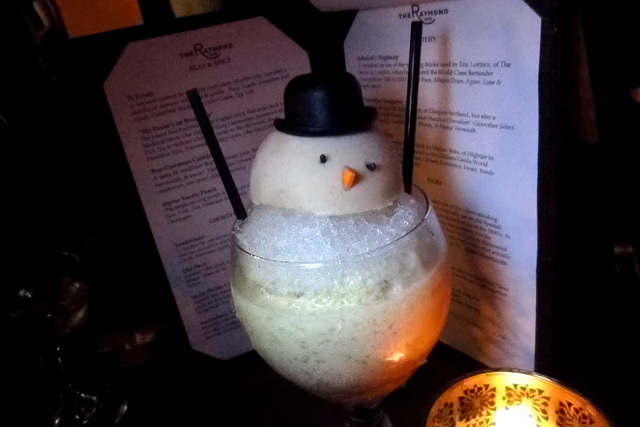 The section formerly known as Shaken has become Frothy, which includes the Admiral’s Nightcap, made with aged rum, Allspice Dram, agave, lime and apple juices. The Admiral’s Nightcap, which could easily be featured on a menu in the warmer months, is an 1886 take on a cocktail created by Erik Lorincz (American Bar at The Savoy) when he won the 2010 Diageo Reserve World Class Bartender of the Year competition. LA’s beloved Maurice Chevalier IV, Scotland’s Dean Evans and London’s Marian Beke are also paid tribute in this section.